Caring for elders at home may be overwhelming at times, but adult day centers can offer caregivers respite and give loved ones opportunities for social activity and/or management of medical conditions. After a hard day’s work, Margaret comes home to an alarming phone call. Her sister, Judy, is on the line and says she’s worried about their mother. When she visited their mother’s home, Judy found their mother sitting in front of the television gazing blankly into space, and she looked tired, bored, and somewhat depressed. When she complained of pain on her backside, Judy found some redness in the area that looked like the start of a bedsore. “It’s no surprise since Mom stays in bed most days,” Judy says. A wave of panic washes over Margaret as she envisions the worst. “Maybe it’s time for a nursing home,” Judy says, something Margaret has dreaded since their mother first became ill.
“But we promised we would never do that to her,” Margaret says, despite knowing that her mother needs more help. “I just don’t think we have any other choice,” her sister responds, as Margaret takes a hard swallow and feels the distress settling in her like a pound of cement. As older adult loved ones age, family members often watch the healthy fall ill and the strong become frail. With more than 75 million baby boomers in the United States, the reality of aging stares us square in the eye, leaving the present generation with a huge responsibility: caring for elder loved ones. Although this topic may be difficult for some and panic inducing for others, it is an inevitable reality most people must face. But the more caregivers and their loved ones know about their options, the better prepared they will to be make sound care decisions. When it comes to aging, many individuals know of only two possible care options: hiring a home health aide to care for the older adult in the home for several hours per day or around-the-clock or nursing home placement, particularly if he or she is medically complex and in need of constant supervision. In the example, two daughters found themselves at a crossroads when the time came to make a difficult decision regarding their mother’s care. Seeing their mother decline physically, emotionally, and cognitively, they both knew that something needed to be done—and fast. One daughter was quick to suggest a nursing home, while the other struggled with this option, knowing that she had once promised her mother to never go this route. But what if there was another way, a solution that could potentially restore their mother to better health and improve her quality of life without the need for nursing home placement? Adult day centers were created for just this purpose. They are facilities that offer much-needed respite for caregivers while providing older adults with medical/nursing care or supervision, door-to-door transportation, daily activities, peer interaction, physical exercise, and hot, nutritious meals. Social model day centers cater to a specific population, such as those individuals who do not need medical or nursing care or who have Alzheimer’s disease and related dementias as their primary diagnosis. Medical models contain a nursing component, and there are times when participants need monitoring regarding their medications or vital signs, according to Christine Powers, MS, director of adult day services and business development for CARES in Hudson, FL. She says these models offer sophisticated interventions, including tube feedings, colostomy care, dressing changes, diabetes testing, and even hospice care. Usually, they require a PhD or MD to be on site to oversee the program, and that can make them more stringent. When comparing medical models with social models, there is a degree of opposition among experts. Powers believes that “social models are limited in their ability to keep participants in the setting when their medical needs become [exacerbated],” whereas Christopher Nadeau, MS, QDCS, TTAP-C, executive director of the NY Memory Center in Brooklyn, believes that medical models remove the “home away from home” environment when there are staff members in scrubs with stethoscopes around their necks. Nadeau believes the best model is one that blends health, social, and medical services based on need while maintaining a vibrant social environment rooted in the creative arts, offering age-appropriate activities, and embracing evidence-based and -informed methods. The best way to determine which center would be more fitting is to conduct a thorough needs assessment on physical and cognitive status. This would indicate whether the individual requires daily medical care by a professional or can succeed in an environment geared toward peer interaction and engagement. However, caregivers don’t automatically realize this about adult day centers, and often it takes persuasion merely to get them to the front door. “There is a lot of guilt in families where they feel like they aren’t doing their job but are abandoning their loved ones. Social workers need to encourage them that they are doing something for [their loved ones], not against them,” explains Lynn Reeves, executive director of The Caring Place in Hot Springs, AK. • Start with education. Many caregivers and elders simply don’t know about all their options. They need a strong and supportive advocate to outline their options and guide them in the right direction. When it comes to difficult decision making, social workers can help families find their way. Families need to know where there are medical and social model centers that could meet the needs of their loved one. “After doing a proper assessment and clearly identifying the families and individual goals, and becoming familiar with community resources, a social worker can make excellent recommendations for placement,” explains Marianne Nicolosi, LMSW, executive director of the Bay Ridge Center in Brooklyn. Certain aspects of adult day centers will be especially desirable to caregivers, such as the amount of money they could save compared with the cost of home health care or nursing home placement. • Suggest a tour. Although educating caregivers and elders about adult day centers is a crucial first step, sometimes they need to see a facility in order to develop a full picture and understand their options. Both medical and social model centers offer facility tours along with the opportunity to meet the staff and observe other participants. A good fit is important for family members and their loved ones, and both need to feel comfortable to promote retention and long-lasting success. Schwab always recommends that people tour her center before making any decisions. “We don’t enroll anyone until they come and visit because they have to be happy here,” she says. She reassures social workers that it may take many tries to convince an older adult or his or her family members that an adult day center is the best option but encourages them not to give up. “Sometimes they are not ready for it or sometimes it is because of denial,” she says. Although the transition initially may be difficult, it’s worth it for them not to give up on the center, Biscan says. Schwab finds that caregivers who initially are reluctant to have their loved ones attend an adult day center often change their minds once they realize the benefits. • Take advantage of a free trial. If a caregiver and elder aren’t quite sold after touring an adult day center, a free trial is the next step. Free trials allow the individual to participate in a day’s worth (or more) of activities and enjoy lunch with their peers before determining whether the center is a good fit. It also allows the caregiver to have some peace of mind that their loved one had fun for the day in a safe environment. Some facilities even will pair prospective members with specific activities, which may be organized by days of the week, to individualize their experience and promote successful outcomes. Sometimes social workers may meet resistance even after employing all of their psychosocial counseling skills. Hoye says the reality of using an adult day center is challenging for many, and that often an older adult’s spouse or children feel bad about leaving their loved one for the day. She often asks them to remember the first day of kindergarten, reminding them how hard it was to leave behind their loved one but also reassuring them that it’s good medicine for them to be away for just a few hours while their loved one is kept stimulated with various activities. When memory loss is involved, other factors need to be considered by family members. The Friendship Center utilizes a whiteboard, where at morning drop off, caregivers write their name and their pickup time in their own handwriting. If the participant becomes anxious or confused about where his or her loved one went, the staff simply takes the white board to the elder and points to the loved one’s arrival time. “This program has been very successful here,” Hoye and Jorgensen say. Nadeau suggests that in these challenging situations, “It can be helpful for the loved one to sit in the back of the room and quietly observe without the participant knowing that they are there. [Families] will often see that their loved one is truly enjoying himself and participating in activities.” He also believes that it’s important to give new participants time to adjust, about two weeks for most people. Adjustment for family members is just as crucial. For some, the thought of taking their aging loved one out of the home is an admission of failure, as though they didn’t do enough to keep him or her thriving otherwise. “They don’t feel as though anyone can do as good a job as them, but in holding monthly support groups, my goal is to help them recognize that it’s a different job,” Reeves says. Nadeau believes that when it comes to comparing one adult day center with another, caregiver support services may be the tipping point for the family. Although elder home care can elicit a host of emotions for many people, caregivers need to do their homework before making any quick decisions. 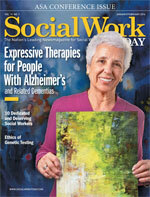 A social worker can be integral in providing the necessary information, guidance, and sensitivity to make sound decisions about adult day centers. Whether caregivers choose a medical or social model adult day center for their loved one, they should know that they have made an informed choice about the best possible care available and rest assured that they played a key role in improving their loved one’s quality of life. — Susan London, LMSW, is a freelance writer based in Brooklyn, NY, and the program director of Heart to Heart social adult day services in Crown Heights, Brooklyn.